If you enjoy hunting whitetails, no matter when you hunt or your weapon of choice, Brassica food plots can offer premium nutrition and attraction and a lot of bang for your buck! The term Brassica, is a food plot “buzz word”, especially this time of year…but what is it about a Brassica that makes them so attractive to deer and deer hunters? Brassica’s are a group of plants that are members of the Mustard family and in the “Deer World” consist primarily of varieties such as; Turnips, Rapeseed, Radishes, Canola and Kale. These are high protein, high energy, high forage food sources that are extremely effective late season food plots to attract and feed your resident deer population. Brassica plots can be planted in the Spring, Summer or early Fall and will reach maturity in 60-90 days. PLANTING: Brassicas are some of the most commonly planted food plot varieties for whitetail deer, because they are easy to establish, grow quickly and will grow in a wide variety of climates and soil conditions. Brassicas can be planted in the Spring, Summer or early Fall and will grow in a wide range of soil conditions (pH 5.3-7.0), but prefer a well drained area with a soil pH of 6.0 to 7.0. These plant varieties are fast growing forage crops that will reach maturity in only 60-90 days. Brassica seeds are very small and offer food plotters flexibility in their planting methods as they can be planted in situations where equipment is used to till and cultipack the seed bed or in “no till” situations where weeds are eliminated and seeds are broadcast prior to a rain creating enough seed-to-soil contact to germinatem, grow and thrive. Easy planting and quick germination are just a couple of reasons that make planting Brassicas so popular to use as food plots for deer. 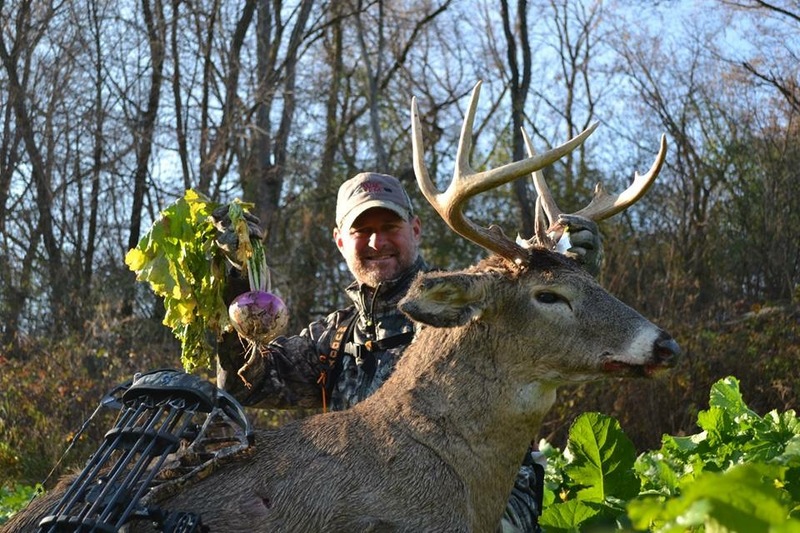 FORAGE AND NUTRITION: Brassicas offer the perfect Fall and Winter Food Plot because they grow so quickly and provide highly nutritious leafy forage and some (turnip/radish) also grow a “tap” root that is highly nutritious and digestible. Brassica plants, can produce as much as 12-20 tons of forage per acre (depending on variety and soil condition) and are very high yielding mixes…which is important in keeping deer on your property on a year round basis. Deer are grazers and virtually eat all day long…one deer consumes on average 1.5 tons of food per year, twice that of the average human and the equivalent to 40 square bales of hay! Not only do Brassicas provide a lot of forage, but it’s highly nutritious and highly digestible forage. The large leafy greens in Antler King’s Brassica mixes (Honey Hole, Slam Dunk, Lights Out, Trophy Clover, No Sweat, Mini Max) provide 15-20% protein and the plants that have roots/bulbs (turnip/radish) will provide just slightly less protein in the root as well. While corn has long been known as a high energy food source deer will eat in the Fall and Winter to pack on weight/fat for the Winter, high energy Brassicas like turnips and radishes offer a better, healthier energy option. Turnips/Radishes offer equivalent amounts of energy (4% Gross Energy) to corn while being much more digestible and palatable, as corn is very difficult for a ruminant species like a deer to digest. The leafy greens of brassica plants will also be eaten throughout the Fall and Winter, although consumption of the greens and roots will increase as the weather turns colder. Many of the brassicas will change leaf colors (red/purple/bronze) to indicate maturation and unlike cereal grains and oats Brassicas remain highly digestible well into maturity (60-90% digestible nutrients) making this sweet flavored, high protein and high energy food source the PERFECT Fall and Winter food plot for whitetail deer. ATTRACTION: Other than being highly nutritious…what makes them so attractive to deer in the Fall and Winter? As I mentioned, the leafy greens of these plants can and will be eaten prior to your first hard killing frost, but may taste a little bitter in their earlier stages of development (nature’s way of allowing the plants to reach maturity and avoid over-grazing). However, following the first hard killing frost or consecutive frosts consumption and attraction will increase. There is no definitive temperature that will trigger this change as it can vary from plot to plot, depending on maturity level and when the plot was planted. These drastic changes in temperature will help trigger plant maturity, which in turn creates a molecular change within these plant varieties. The results of this dramatic molecular change allows the plant to convert the starches that it has stored up during growth into highly sought after and sweet tasting sugars making the plant even more palatable and attractive than it already was. It’s this molecular change that triggers “The Brassica Blitz”, when deer will flock to these sugar/energy filled plots to consume the highly digestible, highly palatable and highly nutritious forage. As deer fatten up in anticipation of “The Rut” and recover from “The Rut” these highly nutritious, high energy food sources are just what they need to gain back their weight in preparation for Winter, as bucks can lose up to 30% of their body weight during the breeding season. The combination of the molecular change creating sweet tasting sugary plants and the highly nutritious food source triggers the “Brassica Blitz” that all hunter’s dream of! 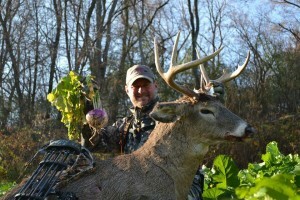 It’s during this time that hunting over a Brassica food plot is highly recommended. GOOD FOR THE SOIL TOO: Not only are Brassicas highly effective Fall and Winter hunt plots and food sources for your deer but they can be an important tool in promoting a better soil environment. When planting in the Summer/Fall Turnips and many other Brassicas do an excellent job of suppressing weeds and are highly efficient recyclers and decomposers. Turnips and Radishes are natural tillers of the soil as their roots help break up soil compaction, aerate and loosen the soil and pull nutrients into the upper portion of your soil bed. When tilled under the following Spring turnips and radishes will quickly break down and do a great job of recycling important nutrients and organic matter back into the soil. Rotating different Brassicas on a yearly basis can be beneficial to your soil and in turn yield more forage on a yearly basis. LASTLY: NOT ALL BRASSICAS ARE CREATED EQUAL, as different Brassicas will produce different results…make sure when you’re selecting your Fall food plot varieties you choose food plot mixes that are specifically designed for deer, like the wide variety of mixes from Antler King Trophy Products, Inc. All of which are hand-picked and rigorously tested in a variety of growing conditions to help ensure user success, superior attraction, palatability, digestibility and nutrition. When the 2016 planting season rolls around I highly recommend incorporating food plot mixes with brassicas into your yearly rotation to add a highly nutritious food source for your whole deer family in the Fall and Winter. When you’re perched above your food plot next Fall and you witness “The Brassica Blitz” for yourself all the hard work and anticipation will be rewarded with an epic sit you won’t soon forget. Good luck this Fall and Happy Hunting! Awesome article and thank you for the great information! Thanks Jim, we appreciate the kind words! Wanted to shed a little light on why Brassicas are so popular and so effective…they really provide so much to your Deer Management Program. Great article,can’t wait to get planting as the fall hunt prep work begins and we set our sights on giving the deer what helps them get through another season growing to their trophy potential. Hi Randy! I’ve had clients planting brassicas, oats and our fall winter spring right now in Alabama…since they were finally able to get some rain. I would definitely take the risk at this point to provide the plots for my deer in the Winter months. Mother Nature will have to cooperate in order for it to be successful, but I’d like to think there is plenty of moisture, sun and warm weather ahead for a successful plot! Good luck. What type of fertilizer should I use on the no sweat plots? I planted mine in the early spring down in Ga. (we have had a warm winter/Spring) Will the deer eat them throughout the summer? I also planted trophy clover. I wanted to supplement the brassicas to give them time to mature. Typically with No Sweat I will use a 13-13-13 fertilizer on it to provide nutrients and optimize growth. It’s a great mix of early, mid and late season food. Typically the deer will eat the No Sweat mix throughout the summer as the plant varieties offer good protein levels as it is growing and is a very nice way to supplement your Trophy clover plot. thanks again!